Why Helix Angles Are So Important For Machining Aluminum — C&B Supply, Inc. The helix angle of an end mill refers to the angle formed between the centerline of the tool and the edge of the rake face. Choosing an end mill with the right helix angle for your application can mean the difference between moderate or excellent results in aluminum. But how do you know which design is right for your job? The appropriate tool to use depends on what you're trying to accomplish. 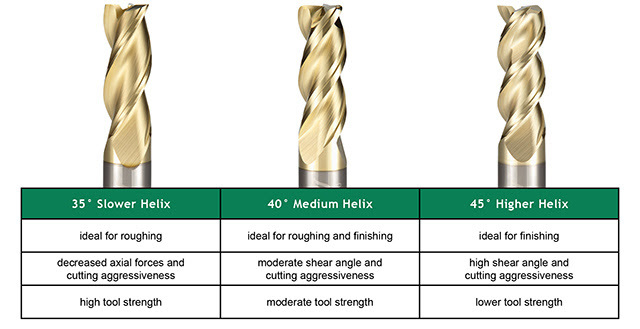 While a slower 35° helix is ideal for roughing application due to its greater strength and capability to cary a larger chip load, the higher 45° helix is well-suited for finishing applications where the tool is running much faster, but removing minimal material. The medium 40° helix balances the benefits of slow and high helixes and is equally suited to roughing and finishing, making it a good choice in applications where tool versatility is required. Helical stocks hundreds of high performance end mills for aluminum in three helix configuration options: 35", 40", and 45".